Ever since last night I have wanted to make a thread about every kind of contribution I did for this community. My name’s DerTheVaporeon, and here I bring you all of the stuff I have done in all of my life in FEUniverse. My first experience with mugs date back to when I joined in December 2017. Back then, my first creation was of course Monika, but back then it wasn’t so great and had one more flaws. I started on improving, and eventually I moved on to splices, which resulted in doing more mugs of varying quality, even a improvement to Monika, and better customs. To say the least, these are my creations so far. These mugs are one of the many of my first, most of them have oofy frames, but this shows how early my work was. Oh look it a Fern. Fern a cutie. And these are only one edit and a cutie after another. 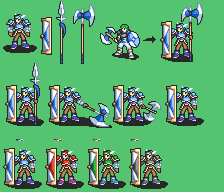 The axe girl was pretty much a personal favorite, done with the work of the whole spriter community, though I got half of the job done. The custom is basically the Priestess from Dragon Quest III, again. When I started working for the creation of Fire Emblem Resonance, I decided to work on mugs for the project. I was improving in many aspects, but it didn’t reach the semi-perfection scale yet. It’s a bit of an irony, but most of these guys were made for fun, but you’ll recognize faces from that one hack, and some for a cancelled project I won’t name, but that will be remembered for being what Duo Geno Escapo was supposed to be in more competent hands. Here lies a few more notable mentions, most of which are mugs for both the dead project, and Peersucc as they call it. I’ve also included mugs for Half-Emblem, a project I plan on picking up sometime. This was the last batch of mugs I have created so far. Among them, lies a slightly improved DQ3 Warrior, a overhauled Ilios, New Derek, a improved Lucille from Peersucc, and Puyo People. I will be working on more mugs to update the thread. Taking from @Pikmin1211 I decided to make my own thread for stills that may need animation, though these are more for me to reference before I animate it myself. Since I noticed the Ranger’s sword animation was pretty crap, I decided on looking to the Vortz animation from Ygddra Patch, but even that one was uhh… oof. My solution was to make a less-tribal Nomad Trooper, more akin to the Middle East horseback soldiers from Arabia, or crusaders. The palette distribution is eh, but I included a helmetless variant just in case. Following the success of releasing my Ephraim Repack, I decided to edit Eirika somewhat closer to Ephraim if he was a female. This was a result from looking at how Circles’ Female Ephraim was just a headswap (sorry pal! ), and I noticed this is how Void would have looked like, so, look forward to this soon. 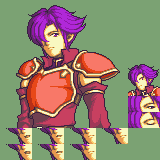 This actually is a edit of Kenpuhu’s Gerik/Caellach/Ross!Hero, to make it look less like them, and fixing several discrepancies, but also I wound up adding a personal touch, plus a spiral shield. Something something can you handle the wight? Not comfortable with how T1 Kelik looks like and animates, I decided to make this still to remind myself to do an animation for it later on. I hope to make the Fairy King proud. One day, internet decided to poop for two days straight, and I was bored and out of data, until I thought about the Tarvos from FE8, and got a groan at this japanese… meme about Centaur Sedgar, and thought of Shining Force at the same time, so my boredom won over my focus on the War Monk. By the time I am typing this, I have already uploading the boye. Crossbows are still in progress, and I gotta fix the upper bodies soon, but yeah, they’re intended to be T1 units. Same ability to reduce Bow damage, but also coupled up with the ability to reduce magic as well. Uses Lances and Axes, to compete with Warrior (Axe and Bows), Hero (Axe and Swords), and Berserker (Axes and Crits). And that’s it. I will keep this topic up to date, if needed. Feel free to post a comment, if you want! All this stuff looks pretty cool, good on you. Can you… handle the weight… of those who have lifted at the gym and did over thousands of pushups and burpees, while simultaneously wincing at the sharp edges? Kain, grant me a better T1! 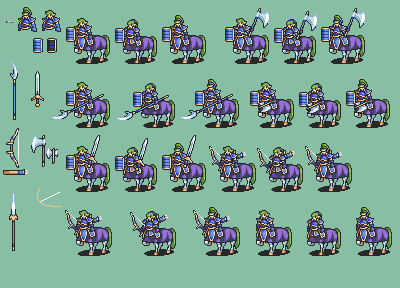 @Dellhonne Just saying that those sprites on the left (the bisop, mage, both sages, that ugly shield general, the FE10ish myrm, and the brigand) are sprites I made when I was like 13, so… Not trying to be confrontational but where did you get them? Also just wanted to say I’m a big fan of your work Der! That’s fine but please don’t ever post MY sprites anywhere ever again. I see you’ve been doing that a lot so just don’t 'cause like 1) They are NOT yours to post and 2) They ugly and old and I was a child when I made them so please stop spreading them around good lord.